A care worker has been thrown behind bars for Christmas – after stealing money from a DEAF AND BLIND woman. 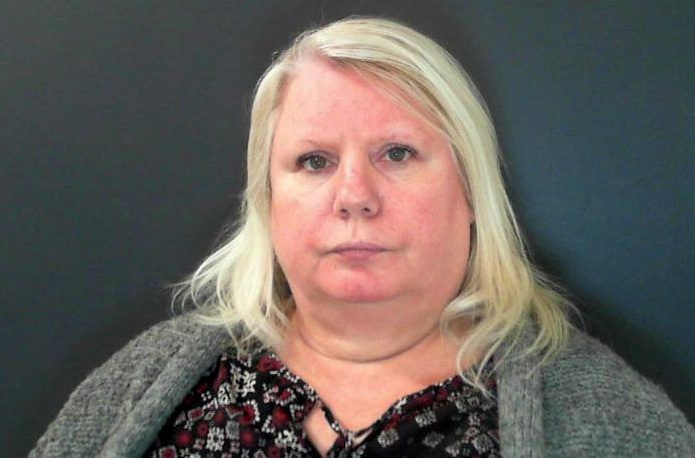 Michelle Chandler, 53, was a key worker when she funnelled thousands of the victims’ cash into her own account over a two-year period. Chandler was jailed for 20 months in December but confiscation proceedings were only heard at York Crown Court yesterday. Judge Andrew Stubbs QC ordered the care worker to repay just one pound, despite havign taken over £8,000, a nominal fee due to her declared financial circumstances. Chandler was a trusted worker at Foresight Residential Home in Harrogate, North Yorks., which looks after those with dementia, learning difficulties, sensory impairment and epilepsy, York Crown Court heard. One of the named victims, 52, was deaf and had been blind since birth. The other victim was a 38-year-old woman with learning difficulties who was also registered blind and suffered from short-term memory loss and seizures. Chandler, who had been one of their chief carers for years, got hold of their bank cards. She came under suspicion after an investigation was launched by the care manager, who noticed a number of “unaccounted” transactions on the victims’ bank accounts. The manager noticed there were no records of money being placed into the victims’ purses for everyday needs, as was the care home’s policy. The fraudulent transactions pointed straight to Chandler, who had worked at the home for 12 years. Records showed that she had transferred or withdrawn a total of £3,681 from the 52-year-old victim’s funds into her own account between January 2016 and January 2018. Chandler, of Fountains Avenue, Harrogate, had been taking weekly sums of about £250 from the victims’ accounts. One of the victims lost £4,870 and the other about £3,600. He said that despite the large sums being withdrawn by Chandler, it was not clear what she had spent the money on. He added, however, that she was not spending the money “on extravagance” or high living, and there was evidence that at least some of it was being used to service pay-day loans. Chandler – whose own mother has Alzheimer’s and lives in a care home – had been to see her GP about depression and may have found herself in financial difficulty after her child-tax credits were stopped, the court heard. She initially denied the offences during police questioning but pleaded guilty to the fraud when the case reached court. Chandler’s solicitor advocate said his client was “ashamed” of her actions, adding: “This offending was not through greed. Chandler, who had lived a blameless life until her offending came to light, was “genuinely” remorseful. The mother-of-two was said to be struggling financially at the time but her crimes were judged to be so heinous she will now spend Christmas behind bars. Jailing Chandler for 20 months, judge Andrew Stubbs QC told her: “You were responsible for some of the most vulnerable people in society. “Such people and their families are entitled to expect that they will be cared for… (but) you targeted the accounts of two of the residents at Foresight Residential Home who, by your own admission, would be devastated by what you did to them. Mr Stubbs said although Chandler had worked hard under difficult circumstances throughout her life, her offences fell into the highest category. The judge said it would be remiss of him not to give her an immediate jail sentence because she had targeted “particularly-vulnerable victims”. Chandler, who remained stony-faced throughout the hearing, was expressionless as the sentence was passed down. She now faces financial-confiscation proceedings which were postponed until April.